School Cottage Self-cateringA comfortable and attractive late Victorian Lakeland stone-built cottage formerly part of the old school in Troutbeck Bridge and ideal in any season. The school, the chapel and the headmaster's house were sympathetically converted into a small cluster of cottages set in an elevated position with fine westerly views to Coniston Old Man and the Langdale Pikes in the distance. This is an excellent holiday base with village amenities close to hand - within easy walking distance of a well-stocked village store for day to day needs and a pub. There are excellent walks in the area and ample opportunities for touring, lake cruises on nearby Windermere and a good choice of eating places for those who wish to dine out. The National Park visitor centre at Brockhole is about one mile away. Accommodation: Front door entrance up a few steps into the hallway which has hanging space for your outdoor gear. 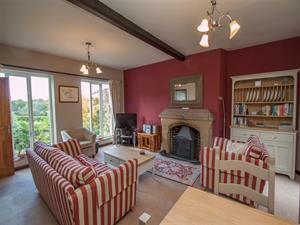 Comfy lounge/dining room with two large west facing windows to make the most of the view (TV, DVD, free wi-fi broadband & telephone) whilst the original stone 'school room' fireplace has a log burning stove. French doors to rear. Modern fitted well-equipped kitchen. Upstairs there are two pretty bedrooms with beamed ceilings and attractive rooflines - the front bedroom has a double bed, feature window providing panoramic views and en-suite wc. The rear bedroom is a twin. Main bathroom with bath, separate walk-in corner shower, basin and wc. Furnishings throughout are comfortable with fitted carpets. Outside: Enclosed pretty patio garden to the front and rear - a pleasant place to sit on sunny summer evenings whilst you plan your next busy day. Garden furniture provided. The Sun Pub at Troutbeck just 50 yards away. Private parking for two cars. Note: Please note the property does not accept pets, however, owners visit with their own dog. Book now for any available week in April 2019 with a fantastic 10% off. Discount shown online. Book online or call 015394 32321 to make your reservation. School Cottage offers weekly bookings starting on Saturday. Includes bed linen and all fuel. One wellbehaved dog accepted at £12. Low Wood leisure club included. Two car spaces.